Forged by hand and machine... One mean piece of equipment. A reputation hardened in the school of hard knocks on construction sites around the country and abroad. We've walked in your boots. We get it. Time is money and you can't afford something that just don't cut it. Our reputation, our people, are what have made Ox the industry leader. We design and manufacture more Class 6 to 8 dump bodies than anyone else in the United States, and export our products to countries around the globe. 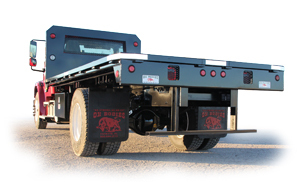 Innovative, rugged, high-performance truck bodies, trailers, parts and accessories. Call us stubborn if you like, we simply don't quit there, our ingenuity allows us to manufacture, assemble and deliver a complete product, in as little as two weeks from order acceptance, standard or fully customized to your specifications. The fastest in the industry – heck, no one else can duplicate what we do or do it better. And if that's not enough, we'll pick up and deliver right to your front door too. We're a restless sort, never satisfied, always wondering what's over the next hill, pushing to improve what we do and how we deliver on our promise to you. Although it sounds inviting, at Ox we never give up. We continually search for and apply state-of-the-art methodologies and technologies. And when we think we've done it all, we search some more to make sure we continue to provide you excellence in product and service that has no comparison. Ox Bodies - "As Strong As An Ox"... The expert in material hauling for earth, industry, and agriculture.